A few weeks ago I decided to set a date for Olivia's potty training. She is 2 1/4 and based on her communications skills, knowing right from wrong and her ability to use the potty on her own, I determined we were ready to go. I got most of my advice from a friend in New York who also has twins and just went through the process. http://www.the4martins.com Prior to our start I ensured we had lots of new underwear, potty time books and ipad videos. I also made sure to have some animal crackers on hand to use as a reward as she doesn't know what an M&M is yet. I also bought her her first tea set and lego's creative cakes set, but those were more for me. Fortunately the weather was absolutely dreary making it a natural choice to stay home all weekend. I was rather hoping the sun would come out giving us some naked time, but it didn't happen until the afternoon on day 3. Go time started on a friday morning allowing my husband to help me over the weekend with day 2 and 3. We made a huge deal about saying goodbye to our diapers and a big hello to our new underwear (Disney's Princesses). Right off the bat she used the potty with no coaching. I knew this would be easy right? Wrong... Instead of placing her on the potty every 5-10min as my friend suggested, I just asked her every 10 minutes if she had to go. She said no, until she had an accident. Moving forward I took her to the potty and sat her down every 10minutes. I offered her watered down juice which she never gets so it was fairly easy for her to produce something every time we tried. After 4 hours of trying to go potty every 10minutes she was pretty fed up with me. After nap and many praises of what a great job she is doing, I decided to spread out our trips to the potty every 30minutes. By the end of the day with a bath and early bedtime we hadn't had any more accidents. Day 2 didn't start off as well as day 1. I assumed she was feeling confident and with Mike around, I laxed a bit rather than giving her my undivided attention. I still set my iphone timer to go off every 30minutes, but she had an accident. I realized to make this work I had to focus all my energy on her so I could gage her urges. 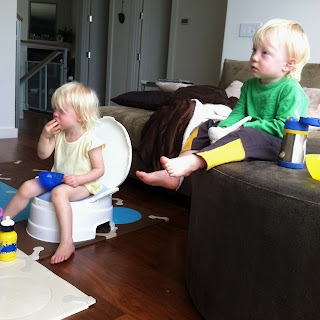 Or another option was to leave her on the potty while she watched an Elmo video and ate a snack (see above). By Day 3 Mike and I were ready to throw in the towel and put her back in diapers due to pure exhaustion with all the attention on her. Luckily, the day cruised by and the sun came out allowing us all a little time in the garden and a chance for me to cook us up some homemade eggplant parmesan. Recipe to follow. As exhausting as this has been and I'm sure we still have some more accidents in our future, I'm thrilled to not be putting a diaper on her anymore. Austin, your up next, but let's wait a few weeks shall we? Whew! Sounds like a lot of work! Are you under a deadline? A need for the pressure? If she's anything like you, she'll want to be in control of the process, and in control of herself. What if you experimented and just let things go...What if she got to choose between diapers and underpants? And if she still has accidents, well, then no big deal. We all fall a lot when we learn to walk. I used to rush Brendan from milestone to milestone, and then wondered why after the fact. He hated it, and I hated it, and no one was happy. They're only little for a short time. I always wished I had just let Brendan be, and had listened more to HIS needs, and less to my own. I wish there were a Buddhist guide to parenting. We could call it, "If the Buddha had kids...." Certain best-seller, don't you think? Next time you're all stressed out, try saying to yourself, "don't just do something, sit there!!!" There is a Buddhist book, actually! Karen mazen Miller has two books out abt parenting (and marriage) that helped me a ton during the tough first year of transition to parenting. She also does workshops in the area sometimes. Check out her FB page!